Washington, D.C. (October 3, 2018) – The Cultural Landscape Foundation (TCLF) today released three concepts for rehabilitating the threatened Clermont Lee-designed garden at the Birthplace of Girls Scouts USA founder Juliette Gordon Low in Savannah, GA. Clermont Lee, one of the first women to be licensed as a landscape architect in the City of Savannah and the State of Georgia, designed the garden in the 1950s and remained involved with its care and maintenance for more than 40 years. Plans to demolish the Lee-designed garden in order to renovate the site were first put forward in 2016, at which point TCLF designated the Lee garden a Landslide® nationally significant, threatened landscape. More recent plans were revealed on June 23, 2018, at which point TCLF renewed its efforts to prevent the demolition. 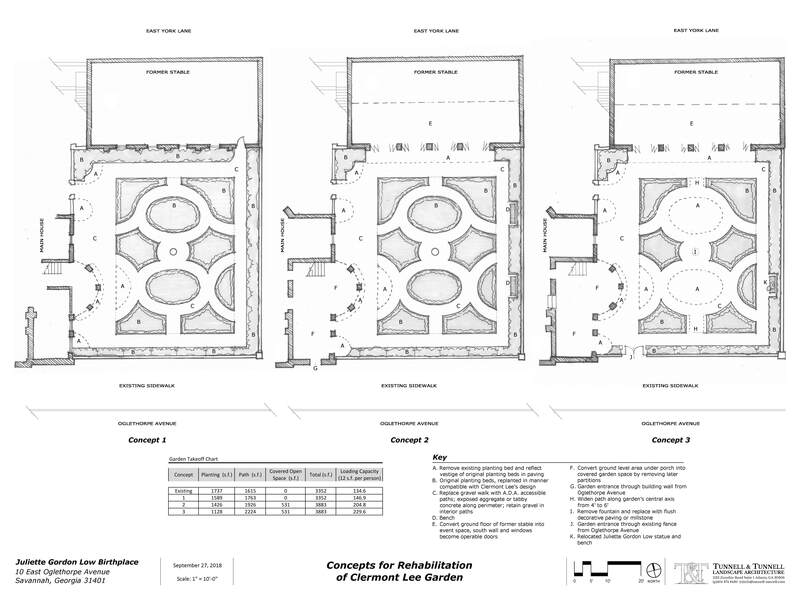 The rehabilitation plans, commissioned by TCLF with support from descendants of Juliette Gordon Low and developed by the Atlanta-based landscape architecture firm Tunnell and Tunnell, are schematic and offer ways to maintain the integrity of the garden’s historic design while addressing programmatic and safety concerns raised by Girl Scouts USA and Birthplace leadership (hi-res versions of the schematics and descriptions are available upon request). Potential costs associated with implementing these plans could not be estimated without more detailed site planning and analysis. Introduce an entrance to the garden from Oglethorpe Avenue. “Our intent in commissioning these rehabilitation concepts is to offer solutions to Girl Scouts USA that maintain the integrity of this important Clermont Lee design and meet the stated needs of the Girl Scouts,” said Charles A. Birnbaum, TCLF’s President and CEO. Clermont “Monty” Huger Lee (1914-2006), a Savannah native who spent most of her career in the city, was among the earliest women to practice landscape architecture professionally in Georgia and was reportedly the first professional practitioner (male or female) in Savannah. She was known as the foremost expert in recreating historic landscapes in Savannah, and her design for the Juliette Gordon Low Birthplace, a Victorian parterre garden comprising intricate geometric shapes, is an important work in her career cannon. Soon after purchasing the girlhood home of its founder in 1953, the Girl Scouts of the USA commissioned Lee to design a garden for the home that would be compatible with its historic character, circa 1850. In a time when it was rare to do so, Lee researched planting plans and plant types in an effort to create an historically accurate garden, and she remained actively involved in the maintenance and care of the garden she designed for more than 40 years. The house became a National Historic Landmark in 1965—the first in Savannah—but the designation does not include the Lee-designed landscape; the designation should be revisited to include Lee’s contribution. In addition to the Birthplace, Lee developed designs and planting plans for other historic buildings in the city, including the Andrew Low House and Green-Meldrim House, along with five city squares that were integral to the colonial plan by James Oglethorpe, and she consulted on historic landscapes throughout Georgia.